A recent presentation from Scott Johnston, a former JotSpot executive, revealed some of the future plans for Google Apps and other Google services. A service based on JotSpot will replace Google Page Creator. "Scheduled to be launched sometime next year (2008), Google Sites will expand upon the Google Page Creator already offered within Apps. Based on JotSpot collaboration tools, Sites will allow business to set up intranets, project management tracking, customer extranets, and any number of custom sites based on multi-user collaboration." The service will also allow you to upload any file formats. You can already see a gallery of applications that use JotSpot. As expected, most Google services will become Gears-enabled and will start to work even when you're offline. "Will users be able to edit docs, spreadsheets and presentation offline? Scott's answer was yes, and that the Google Gears plugin would handle the offline work. In addition, Google Gears support is in the works for Gmail and Google Calendar." Another service that will become a part of Google Apps is GrandCentral, but the integration is not expected to be available very soon. Good news, not soon enough. A company that I convinced to use Google Aps liked everything about it except the lame web page creator. If they would have just formally allowed you to upload HTML it would have been fine, but businesses with existing web sites don't want theirs to suddenly look like it came from a one-size-fits-all template. I even put together a back-door page that jumped to their old HTML (painstakingly uploaded via the web interface) only to find that that trick only worked about 80 percent of the time. I signed up for Jotspot too late to actually get in on it, but it can't be any worse than what Google has put together. I hope that "next year" means January. This has taken too long already. This is scary. if everybody starts doing all their work online like business spreadsheets or whatever, that just means someone ele has access to all your information. all these online calendars and things of that nature makes it very easy for people to know what you are doing. if someone wanted to kill you all they got to do is hack your account and find out where youre going to be. WOW. Way to reach just a little to far with the alarmist ideas. You have taken creating web pages all the way to murder in one paragraph. Jotspot is a great app. I am very excited to see it gears enabled along with the rest of Google Apps. I administer 20 different Google Apps installations for clients and pair them with Drupal websites. The abilitity to marry a ticket system into the mix and allow the customer's internal traffic to stay protected based on their existing authentication systems is a big plus. The Jot UI will no doubt improve to the level of simplicity we see in the wiki and other systems around http://code.google.com with familiar colors and behaviors. My hope is that some of the new features included in Google Sites will also help our customers see the benefit of upgrading to Premier accounts. Premier accounts are affordable compared with the cost of overhead on the managed systems of yesteryear, but it will take more convincing and 'value add' to move away from the free standard edition. I also hope that Sites will be Open Social enabled and extensible as it was previously, with the ability to add in mash-up code and Open Social enabled features to bring sites closer together than ever before. I was at the presentation in Ann Arbor. They showed a screenshot of the Google Apps integrated JotSpot. The logo had the name "Google Work Space". I'm glad this is getting such good press. The presentation was primarily intended to be a pitch to local businesses to migrate to Apps, but it turned into a very interesting Q&A session in which much of this information was discussed. I don't think this was meant to be the "official announcement" but if half of what Scott said is true, the cat is out of the bag...and a lot of people are interested. "This is scary. if everybody starts doing all their work online like business spreadsheets or whatever, that just means someone ele has access to all your information. all these online calendars and things of that nature makes it very easy for people to know what you are doing. if someone wanted to kill you all they got to do is hack your account and find out where youre going to be." Absolutely true man. I was thinking the same. I don't prefer and recommend using it for business work. Um... it is easier said than done to "hack" one's account. Especially since we are not talking about "hacking" Windows but rather an online system administered by GOOGLE, no less. Well, Google will have access to all your stuff. The government will eventually start to win court orders requiring websites to give up user names and info. anythings possible. maybe it will be totally safe or maybe not. Given the state of things today, I wouldnt want to give someone the time of day really. Am I an alarmist. Maybe. But every one wants to tout what a great idea all this stuff is and not once have I read anything bad about it anywhere. So I figured I would add an alternate viewpoint. One day Google will know more about you than you do! Will that be good or bad? This is more of a question. As a jotspot client, will our data be uploaded to the new system? Will the calendar function also be upgraded to Google's calendar function? PS. we're really looking forward to this. Some of Jot's functions will apparently not be transferred to Google Sites, which would make it hard to transfer entire sites. But as to Calendar integration, it certainly makes sense. Just to add on to that, GS is designed more as an internal platrofm for small & midsized companies, which makes it a perfect companion for the entire Apps suite. 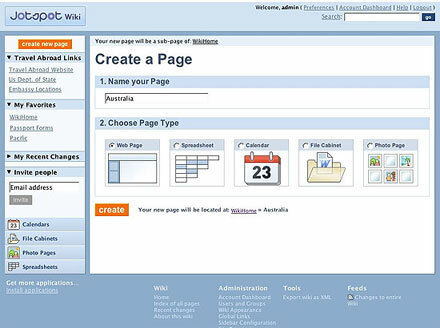 Somehow I can't believe business would eventually give up on lavish public website UI in favor of one-size-fits-all GS templates. The alarmist stuff has been out there since the beginning. Really, the truth of the matter is, it doesn't matter. If the government is going to hack into your Google account to find out that you will be at your daughter's dance recital next Wednesday, so they go to it just to gun you down... don't you think they'd be able to do this WITHOUT hacking your Google account? Social Security numbers, driver's licenses, the Patriot Act, and other things are more alarming than people putting their information online. If you are concerned, just don't put your information online. Most aren't concerned, so they will. Every convenience has its potential drawback. I drive a car, taking the risk that I could die in an accident at any time. I can freak out about that fact and walk everywhere, or I can just drive and relax. I choose to drive and relax. I can't wait!! Where is it? When is it actually launching? Is there a beta i can take part in? Update please!!! This is a great thing, especially for school districts with limited monies and tech guys. Are there any clues to when this might be available? This is terrible news for Jotspot users. Essentially a downgrade of functionality from Jotspot. We run a site with lots of users, highly customized. All that code and almost $100K is now gone. We'll have to wait and see what of Jotspot survived. We picked it because we could extend it. That doesn't seem the goal for this sites product. Well, at least you have an intelligent argument. tho' good news it is... is there any chance that we could see a system soon enough where we can upload designed html pages online through apps... doesnt look like that is happening sooon! Well, the recently announced Google App Engine allows for the hosting of static content (html files, etc...) So, in theory, this system should do the trick. It is currently in a closed beta (10,000 developers were let in... then another 10,000 developers were invited). This may be the alternative everyone is looking for. It doesn't exactly have FTP access... but with the proper settings in a config file, running one command uploads all of your files to their servers. So, I would imagine developers might make this even easier for those only familiar with FTP.